Make the most of speedy, fast and instantly accessible internet with the Samsung Series 5 WiFi Chromebook, rethinking the way you use the internet. The well priced Samsung Series 5 Chromebook can boot up in under 10 seconds, giving you instant access as you browse your favourite pages at leisure. Thanks to deaglecat who found a deal at amazon earlier this evening, which made me find this deal. Currys customer service ... hmmm no thanks. Can i format this thing for Windows? Why when applying for the cashback online the only options for the invoice date ranges from 1st sept 2012 to 18-9-12? just heard this thing doesn't do java.... does this mean no video on sites like bbc news?! just heard this thing doesn't do java.... does this mean no video on … just heard this thing doesn't do java.... does this mean no video on sites like bbc news?! Think you're getting mixed up with Flash, I've uninstalled Java on all my Windows machines since the security issues with it. You cannot download anything onto this computer, everything has to be done via google. You can do documents on there via google but you cannot download itunes onto it or any other programme. Suppose its great if you want a computer that will not get clogged up with stuff. We haven't managed to be able to put our photos on unless we go via a website. My daughter has struggled to get games on there she regularly plays. And the app store doesn't always lead you to right thing. Took a while to get used to but slowly getting there. I wish I has spent my £300.00 on a better laptop with all things we needed, I feel that it is not very good value for money, and think it is very similar to just having a tablet with limited abilities. I didn't realise it was only really use for online,No good if your daughter needs to download her homework! Don't buy if you have limited internet access otherwise your stuck! Ah well, we brought it but I wouldn't recommend it to anyone. Buy a proper laptop! It is like a laptop in terms of the web browsing experience, but would probably not recommend it as a main laptop. is there a software where as soon as my desktop startsup i can have remote access on my laptop. I can turn my computer on remotely using wake on lan, but not remote desktop software . Think you're getting mixed up with Flash, I've uninstalled Java on all my … Think you're getting mixed up with Flash, I've uninstalled Java on all my Windows machines since the security issues with it. Hot, almost everything is online nowadays. Google Apps for wordprocessor so makes an ideal second laptop / kids laptop. Remember to put online calendar reminders to claim the cashback in 30 days from now. Why when applying for the cashback online the only options for the … Why when applying for the cashback online the only options for the invoice date ranges from 1st sept 2012 to 18-9-12? anyone know if skygo is coming to chrome os? Bad time to buy. New Chromebook just announced in US at $250. Will probably be around £170 here shortly - greatly improved over this model. It's more like a netbook. You may be better off just getting a cheap laptop, ones come up on here for less than £250 often. Bad time to buy. New Chromebook just announced in US at $250. Will … Bad time to buy. New Chromebook just announced in US at $250. Will probably be around £170 here shortly - greatly improved over this model. Not it won't be £170 - it is £229 and the differences aren't great. Has a smaller screen too. Can i install windows 8 on this? In a perfect world £170, but the taxman will bump that up. Uses a mobile processor rather than the Intel Atom, not sure if that's an improvement or just a cost cutting exercise. Not it won't be £170 - it is £229 and the differences aren't great. Has a … Not it won't be £170 - it is £229 and the differences aren't great. Has a smaller screen too. Which part of "will be" and "shortly" do you not understand? launch price does not equate to eventual price (if it did, this site would have fewer tech deals). Gotta agree. 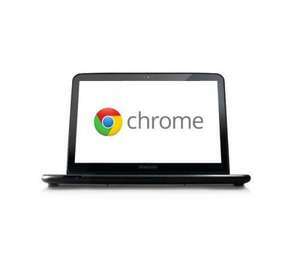 This is an Intel (Atom) based Chromebook, which does seem a bit pointless. There are new ARM processor ones out (or coming out) that are a much more sensible choice (for most people) for this form factor of machine, with their inherent benefits regarding power consumption. I was tempted until I found out it was an old Intel powered one. If I'm going to suffer the restrictions of a Chromebook it damn well better be thin and weigh about a kilo, preferably less. And it still better give me about 10 hours battery life. This sounds rubbish, what is it lately with new technology coming out with reduced functions? Which part of "will be" and "shortly" do you not understand? launch … Which part of "will be" and "shortly" do you not understand? launch price does not equate to eventual price (if it did, this site would have fewer tech deals). Yes it may be £170 a few months down the line but that's life in the world of electronics, you could keep waiting forever for prices to drop. This sounds rubbish, what is it lately with new technology coming out … This sounds rubbish, what is it lately with new technology coming out with reduced functions? What can this not do that you want it to do? Yes it may be £170 a few months down the line but that's life in the … Yes it may be £170 a few months down the line but that's life in the world of electronics, you could keep waiting forever for prices to drop. Will be £10 on Ebay at some point too. So true... Just buy the thing now and stop waiting. When you wait for the next one an improved version of that will be around the corner. .... You carry your Xbox and TV around with you? I want to use something like Outlook/Thunderbird for emails - and be able to find one from 2002 while offline due to no connection, parked next to fields in rural Suffolk, miles from home and reply to it to send later.